Bha Daibhidh Ros fad deich air fhichead bliadhna na neach-aithris airson Herald Ghlaschu air a’ Ghàidhealtachd agus a’ Cheann a Tuath. 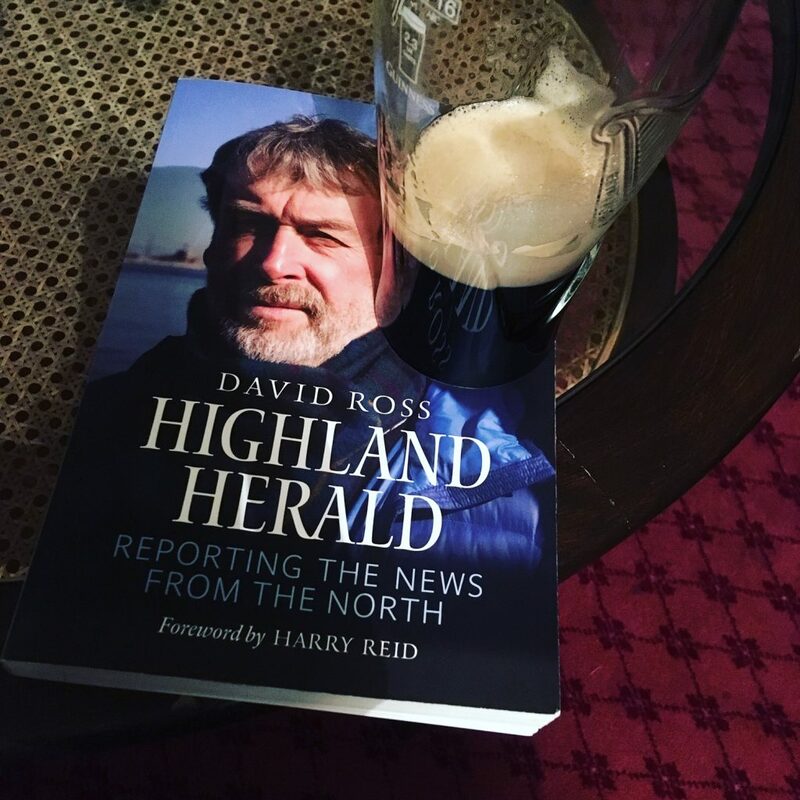 Tha an leabhar ùr aige Highland Herald a’ coimhead air ais air an treis sin agus ’s e leabhar gu math farsaing a th’ ann ach gu math pongail is geur. Tha e air a dheagh sgrìobhadh mar bu dual ’s e a’ gluasad o àrach òg eadar Siorrachd Pheairt agus Eilean Ì tron a h-uile tachartas mòr air a’ Ghàidhealtachd o chionn dà fhichead bliadhna, cho fad ’s gu bheil e a’ beantainn ri eachdraidh nan Gàidheal, le cameos o dhaoine o gach ceann den bhogha-frois, le Daibhidh a’ siubhal eadar Michael Forsyth agus Robbie the Pict gu siubhlach. Bidh ùidh aig cuid san leabhar leis gu bheil Daibhidh pòsta ri nighean Shomhairle MhicGill-Eain, Màiri, an neach-ealain. Tha sgeulachdan am broinn an leabhair mu dheidhinn Shomhairle a tha an dà chuid èirmseach agus inntinneach. Tha an tè mu dheidhinn “an càr mòr buidhe” a bha aige a’ dol gu Eilean Ì a bhith “air adhlacadh le seann rìghrean na h-Alba” mar a thuirt e fhèin a-measg iomadh rabhdan annasach a thàinig o bheul a’ bhàird. ’S e am far-ainm a thug Somhairle air e air ogha, Gilleasbuig “The Philosopher Prince” a’ cur gaire orm cuideachd. Tha athair chèile a’ nochdadh air feadh an leabhair, ach san treas caibideil tha Ros gu sònraichte a’ sgrìobhadh mu dheidhinn beatha Shomhairle. Tha sinn a’ faighinn dealbh gu math pearsanta, blàth air athair, agus seanair a tha nas fhaisge air an fhear smìorail, caran àraid, a bha aithnichte acasan a bha aige mar sgoilear no mar charaid, na am bàrd mòr cliùiteach as fheàrr ann an Roinn Eòrpa. Tha e fhèin ag aideachadh gur fheàirrde sgrùdadh na bàrdachd fhàgail aig Aonghas Phàdraig is Aonghas Dubh agus tha e glè cheart sin a dhèanamh. ’S e seo fear a tha eòlach air a neartan agus gun nàire ag aideachadh a làigsean, agus tha sin na bhuannachd do sgrìobhadair sam bith. Tha e cuideachd a’ toirt dhuinn sealladh air saoghal na luchd-naidheachd san t-seann aimsir. Tha e ag aideachadh nach eil cuimhne cho math aige air rud no dhà leis gun robh deoch an lùib na h-oidhche a thachair e! Chan eil uaill san duine. Tha an reusanachadh agus ìrisleachd sin ri fhaicinn air feadh an leabhair, agus le cìnnt, bha an dòigh sin aige na chuideachadh dha ann a bhith a’ faighinn sgeulachdan thar nam bliadhnaichean le daoine a’ cur earbsa ann gum biodh e cothromach agus gun toireadh e dhaibh deagh èisteachd ge b’ e dè dath a bha air am broilleach. Seo sgrìobhadair a bha dhà-rìreabh thall ’s chunnaic agus chan eil mòran nach eil a’ tighinn a-steach dhan leabhar. Tha e a’ cur clach air càrn iomadh duine, caraidean dlùth a fhuair bàs tràth, Iain Fearchar Rothach agus Tearlach Ceanadach ach ’s mathaid gur e an duine a bhios a’ faighinn an aire as motha san leabhar as dèidh Shomhairle, Iain Prebble, an sgrìobhadair eachdraidh. Bha Prebble na Chanaidieanach a tha aithnichte mar fhear a thug na Fuadaichean agus eachdraidh na h-Alba gu aire a’ mhòr-shluaigh tro na leabhraichean aige – The Highland Clearances, The Lion in the North, Culloden, Mutiny is eile. Cha d’ fhuair e riamh aithneachadh no cliù o na h-acadaimeacaich leis nach robh e sgoilearail gu leòr agus tha an leithid a bhios a’ feuchainn ri lesigeulan a dhèanamh airson na Fuadaichean is eile gu math suarach mu dheidhinn. Ach tha e follaiseach gu bheil meas mòr aig an Rosach air sgrìobhadh Phrebble agus gun tug e buaidh air. San dol seachad, tha e a’ toirt iomradh air an leabhar Mightier Than A Lord le Iain Friseal Griogar, an leabhar mu strì nan croitearan a dhùisg faireachdainnean feargach ann an cridhe Chaluim Dhòmhnallaich Runrig. ’S cinnteach gum biodh Daibhidh air a mhaslachadh leis a’ choimeas ach saoilidh mi gu bheil e freagarrach an leabhar seo a chur ri taobh leabhraichean den leithid Mightier Than A Lord aguslLeabhraichen Phrebble mar leabhraichean sa Bheurla a bhios cudromach san àm ri teachd mar chomharra air eachdraidh nan Gàidheal. Tha e a’ suidhe mar leabhar Fhriseil Ghriogair leis gu bheil e a’ cur a-mach na thachair ann an dubh is geal, tha e a’ dol le leabhraichean Phrebble leis gu bheil e air a sgrìobhadh gu clìste agus a’ dùsgadh smuaintean agus fhaireachdainnean mu cheartas agus chothromachd. Tha Daibhidh Ros a’ toiseachadh le iomradh air an sgeulachd mu dheireadh aige, sgeulachd mu Cheit Fhoirbeis a’ togail dragh mu sgoiltean agus a’ tighinn gu crìch le eachdraidh shoisealta inntinneach mun bhaile far an d’ rinn e a dhachaigh is a thog e a chuid chloinne, Crombaidh, agus gealladh gu bheil e a’ dol a dh’ionnsachadh barrachd Gàidhlig. ’S fhiach an leabhar seo a leughadh agus a thoirt seachad do charaidean. Ma tha thu airson a’ Ghàidhealtachd latha an-diugh a thuigsinn, gus faicinn dè fad ’s a tha sinn air tighinn agus dè cho fad ’s a tha againn ri dhol fhathast – chan fhaigh thu teachdaire nas fheàrr na an leabhar ionmholta seo.